Saying I hate mysteries might be a little strong, but I’m definitely not someone who seeks out these titles or films. It’s just not my genre. But I read all of Neal’s titles for the sheer fact that they read more like travel guides with a who-dunnit thrown in than your average, formulaic mystery thriller. In this recent installment, Neal includes not only the envy-sparking depictions of some of the more beautiful and breathtaking aspects of wild Hawaii (in painstaking detail that only someone who has experienced it firsthand can pull off), but also incorporates a social theme of hunting and poaching on protected land. I especially like her main character in this series, a no-nonsense woman who doesn’t feel the threat to her feminism that causes her to behave in an “in your face” way that so many writers resort to. She’s just a female, that’s all there is to it. She’s fully capable at her job and well-regarded, and I appreciate that. Books in which the woman constantly has to prove herself really are a disservice to women. Shattered Palms is available now! 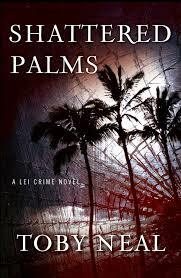 Posted on March 18, 2014, in Uncategorized and tagged book review, Lei Crime Series, mystery, Shattered Palm, Toby Neal. Bookmark the permalink. Leave a comment.